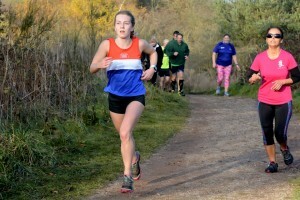 A Breezy but dry day at Park Hall Country Park was the setting for the third race in this years North Staffs Cross Country League. 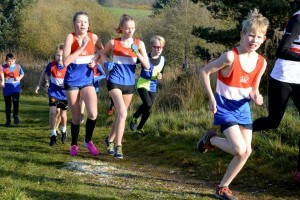 Following the first 2 fixtures at Winsford and Stafford Common all our juniors were looking at improving their individual and team positions, and once again there was a great turnout, with a massive 51 athletes representing the club from U/11-U/20! First race was the U/11 Girls, racing over two small loops (~1800m) our first finisher was Ruby Lovatt in 4th (8:15) with Samantha Pattyson just behind in 5th (8:18). 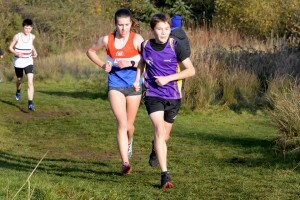 Alex Sutton was next in 14th (8:47) and Maisie Alcock was 37th (10:05). The girls had a great race and finished equal first on the day scoring just 23 points, and going into the final fixture are now in 3rd position overall. Well done and good luck girls. Next up was the combined U/11 Boys and U/13 Girls Race, held over one small and one large lap (~2300m). 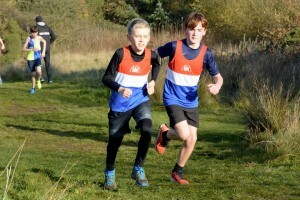 In the U/11 Boys race we had a great turnout of 15 athletes (over 26% of the entire race!) 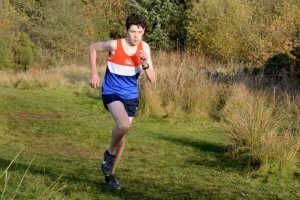 and Oliver Woodward finished in a fine 2nd place overall with a time of 8:53, just 3 seconds behind the winner. Next in was Ben Ford in 8th (9:25), William Tomkinson was 13th (9:38), Jay Marchant was 16th (9:42), Christian Jones was 19th (9:45), Corey Ellis was 22nd (9:53) just pipping George Brownsword into 23rd (9:54), in 29th was Lucas Jones-Barber (10:11), 31st was Lucas Nevard (10:16), 34th was Daniel Armstrong(10:20), Jacob Nevard and Josh Kewish finished in the same time of 10:28 with Jacob finishing 36th and Josh 37th, Harry Ibbs was 45th (10:57), Myles Davison was 54th (11:41) and Harry Hughes completed our team in 56th (11:50). The boys finished 2nd on the day despite scoring just 23 points but remain in first position overall, leading by 20 points – Great running and a final big turnout needed again lads to secure overall victory in the league this year. In the U/13 Girls section of the race we had 7 athletes competing and just 9 seconds separated our first 3 finishers. First home was Beatrice Wakefield in 16th (9:42) followed by Lucy Brownsword in 17th (9:46) an Mathilde Wakefield in 18th (9:51). Next in were Molly Ibbs in 22nd (10:15), Olivia Tipping in 29th (10:34), Holly Cooper in 31st (10:43) and Caitlin Taylor in 40th (11:32). The girls finished in 4th on the day and are in 4th Overall. Well done to all seven girls, keep it going for the last fixture. Next race saw the combined U/13 Boys and U/15 Girls, running 2 identical laps (~2700m). In the U/13 boys race Jamie Betteley, Daniel Jones and Charlie Ranford were are first three finishers. After a close race throughout, they finished with Jamie 11th (9:52), Daniel 12th (10:00) and Charlie (10:01). Also racing off were Joseph Stevens and Sammi Besa, with Joe finishing in 32nd (10:52) and Sammi just 3 seconds behind in 34th (10:55). Connell Latham and Dylan Marchant raced in for 42nd (11:11) and 43rd (11:12) places respectively. Harrison Everard and Elliot Sharman both showed their increasing fitness, with Harrison finishing 52nd (12:06) and Elliot in 56th (12:24). A great turnout of 9 boys meant that the team finished 3rd on the day, and whilst they remain in 5th position overall another good turnout in the final fixture could see them claim team medals. 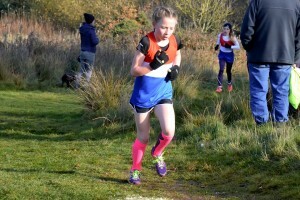 In the U/15 girls section of the race we had just one competitor with Poppy Ranford running really strongly over the tough course and finishing in her highest position in the league (so far!) in 9th (10:46). Well done Poppy. Next up were the U/15 Boys and U/17 Women who were competing over 2 laps which included the top field (~3000m). In the U/15 Boys race Louis Wakefield looks to be getting stronger and faster with every race and he finished in a fine 3rd position in 9:36. Tyler Davison also ran well and was our only other finisher in 22nd position in a time of 11:05. Unfortunately the lack of another team member at this (and the first fixture) means that they will not be eligible for team medals. Well done Louis and Tyler. 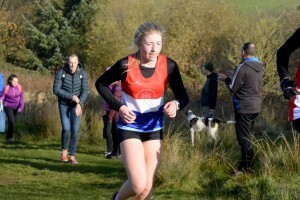 In the U/17 Women’s section we again had four competitors and it was Nadine Tomkinson who lead our team home again and went one better than last time out to claim 2nd (10:47), Misha Twardochleb, Elizabeth Clarkson and Scarlett Cotton had their own battle once again, with Lizzie finishing in 5th (11:02) just 5 seconds ahead of Scarlett in 6th (11:07) with Misha just 12 seconds behind in 7th (11:19). Another fantastic team performance meant that our U/17 women won with just 13 points and baring disaster at the final fixture look on course to secure yet another U/17 team victory for the club after wins in 2014, 2015 and 2016. Well done to you all. Next were the U/17 Men who run in with the U/20, Senior and Masters Women’s race over 2 identical large laps (~5200m). First back for the club was Lewis Nagington in 6th position (19:36), Elliot Smith was 19th (22:26) and Thomas Mogg completed the team in 22nd (24:14). The U/17 men finished in 4th on the day (just 1 point behind 3rd) but actually improved their overall team position to 3rd with just the final fixture remaining. Well done Lewis, Elliot and Thomas, one more race to secure those hard earned medals. The U/20 women compete against the seniors and masters women, and once again the overall race (and therefore obviously the U/20’s) was won by Rebecca Twardochleb, who lead from gun to tape to win by a margin of 31 seconds, in a time of 21:21. Fellow U/20’s Sophie Goodfellow and Lucy Matthews both finished in the top 10 overall, with Sophie in 9th (22:55) and Lucy in 10th (23:07), fellow U/20 Alex Oakley finished in 36th position overall (25:09) and this meant that they secured 1st, 2nd, 3rd and 6th in the U/20’s race! Becky, Sophie, Lucy and Alex also helped our Senior Ladies team to yet another convincing victory in Division 1, scoring just 15 points and beating their nearest rivals by 31 points. Well done to all four of our junior athletes. The U/20 Men also compete within the Seniors and Master Mens race, covering 2 of the largest laps (~7000m). Jordan Nixon and Jacob Droogmans both had good races in what must be remembered is their first season racing the seniors and over the increased distance. 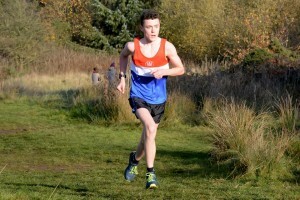 Jordan pipped Jacob to finish in 20th position (25:14) with Jacob just 3 seconds back but recording his highest finishing position in the league to date in 22nd (25:17). Jordan finished as 4th U/20 and Jacob was 5th. Both Jordan and Jacob were part of the Senior Mens team that finished in a fine 2nd position on the day (recording just 132 points) and have now moved into second position overall by 36 points. Well done to you both and good luck, individually and as part of the senior team at the final fixture in four weeks at Rodbaston.